There is a somewhat surprising trend occurring across the United States – older married couples are deciding to get divorced at much higher rates. In fact, divorce rates for couples over the age of 50 have doubled since the 1990s. If that was not surprising enough, the divorce rate has tripled for married couples over the age of 65. 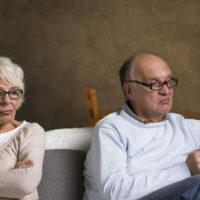 Getting divorced at an older age comes with unique concerns and considerations you need to be prepared for, especially when it comes to your finances and retirement. If you fail to prepare, you could wind up living destitute during your golden years. For example, approximately four percent of married couples older than the age of 62 live in poverty, while fourteen percent of divorced men and a shocking thirty percent of divorced women are impoverished. When you and your spouse reach the decision to pursue a divorce, you need to thoroughly evaluate your living expenses and what you expect to receive from retirement savings. To avoid the financial challenges that often result from divorce, you may either need to return to work, accept working longer (i.e. beyond the regular retirement age of 65) or accept lower living standards. You need to make sure you pursue a sufficient amount of marital assets and alimony. It is understandable to struggle with making certain financial decisions, especially when you may also be dealing with the emotional stress and anxiety associated with a divorce. You might also be concerned about the costs of prolonged litigation. Nevertheless, you need to make sure you get what you are rightfully owed because you will need those assets in your post-divorce life. There is no way around it – a divorce can significantly impact your quality of life when you decide to retire and stop working. You may be required to live on only half your expected income from your retirement savings and social security. This is because Texas is a community property state where marital assets are generally divided equitably between the parties. This means a division of the assets in your 401(k) retirement plan, individual retirement account, and any pension you may be entitled to. When retirement funds are being divided, a court will likely require a Qualified Domestic Relations Order (QDRO). This is necessary to divide money in retirement accounts without incurring any early withdrawal penalties. As you can see, getting divorced after the age of 50 can get complicated very quickly. This is why you need to hire a Texas divorce lawyer who knows how a QDRO works and what needs to be included in this court document. An improperly filed QDRO will delay the divorce process and result in you paying additional QDRO fees. Get in touch with the law firm of Lindamood & Robinson, P.C. We possess decades of experience helping people through the divorce process, including older adults. Contact our office today to schedule a confidential consultation to discuss your situation.